Suppose that you have monthly retail sales data starting in September 1978 in a SAS data set named SALES. At this point, you do not suspect that any calendar effects are present, and there are no prior adjustments that need to be made to the data. 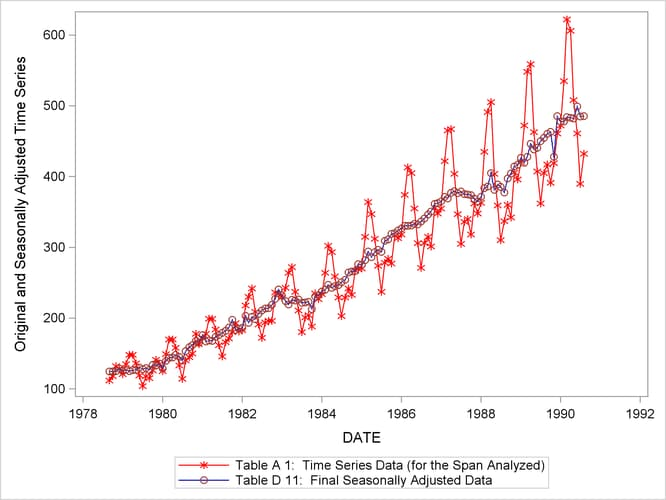 The results of the seasonal adjustment are in Table D11 (the final seasonally adjusted series) in the displayed output shown in Figure 37.1. You can compare the original series (Table A1) and the final seasonally adjusted series (Table D11) by plotting them together as shown in Figure 37.2. These tables are requested in the OUTPUT statement and are written to the OUT= data set. Note that the default variable name used in the output data set is the input variable name followed by an underscore and the corresponding table name.